Lately, there has been something of a vogue among poets for the creation of a ‘running character’ who figures in a sequence of poems. Alan Brownjohn may have started the trend with the misadventures of the slightly insecure Ludbrooke; but Peter Phillips has subsequently introduced us to the fictional poet George Meadows and Danielle Hope’s Mrs Uomo has given a voice to those thwarted by authority – particularly by official communications. Following her first appearance in Giraffe Under a Grey Sky, Mrs Uomo gets headline billing in the new collection Mrs Uomo’s Yearbook – but features in only one of the six sections in a book which also includes groups of poems about coastlands, trees and ‘ordinary people’, together with some translations (called ‘Adaptations’) from the Italian. Such a book certainly deserves to be commended for its range. Some of the Mrs Uomo poems place her in a familiar role as a kind of ‘everywoman’ (or even an ‘everyperson’, although she might not approve of the gender-neutral cop-out). Hence it is perhaps inevitable that some of her observations are a little trite: but her loosely coupled trains of thought also bring us delightful small surprises. For instance, in a meditation on the prefix ‘un’, she reminds us of those everyday words which seem to exist only in their negation: scathed is worse than unscathed. In the same poem, her innate kind-heartedness makes her unwilling to collude with media attempts to uncouple the deserving / from the undeserving poor; and she is sceptical about officialdom’s ability to discern a way through a devious double negative to decide who is not unable to work. Health has long been an issue for Mrs Uomo – both her own and also, occasionally, that of her friend Mrs Harris. Hence it does seem a little out of character that perusal of lengthy instructions for hospital visitors should provoke her into a rather anti-social curiosity about whether she is allowed to poke wounds or … steal tissues or towels. But, apart from this lapse, she does emerge as a rounded personality, whose running problems with everything from economics to biscuits is handled with a well-judged lightness of touch. There are times too when Hope is able to add extra weight to her character’s naive observations: Mrs Uomo saves up the elastic bands shed by the post-lady, presumably in the hope of finding a use for them; but as they perish and become useless they serve as a poignant marker of the months passing while Mrs Uomo waits for an operation. This broad humour is untypical. 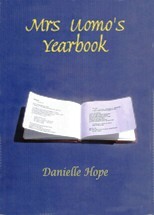 In the main, the yearbook poems are more thoughtful and include some very good passages. February’s polar nights of little sleep / when moons multiply; the (slightly mysterious) observation for July that in the Milky Way over Japan / magpies form a bridge / for banished lovers; or the closing image for November in which distant poplars stand like snuffed candles – all these seem to belong to a different poetic world from the one that Mrs Uomo usually inhabits. We wonder whose kerb it will visit. That sobbing is a good, unexpected word, and so is kerb as an alternative to the more predictable door or gate. this ever more – that she never even existed. standing precariously above a checkerboard of vines. When there is so much to speak favourably about, it seems a pity to have to register any reservations. But I did encounter a couple of rather off-putting proof-reading errors: in a poem about rowing I would expect scull rather than skull (unless some very subtle word-play is eluding me); and in ‘Farmhouse’ the cow should surely be enduring a breech rather than a breach birth. More seriously, I do think this book would have benefitted from more rigorous editing. Some of the poems – for instance several rather bland descriptions of places – seem to me to fall some way short of the standard of the finest and might perhaps have been omitted. At 80 pages, the collection is somewhat longer than many I have read recently; and this, coupled with the rather unfocussed titles of some of the sections and the fact that two – or even three – poems are sometimes squeezed into a page, does rather suggest an attempt to include as much as possible rather than a wish to hone the book down to its very best elements.